(Paul Rosenberg and Co., London, New York and Paris); sold 1927 to (M. Knoedler and Co., London, New York and Paris); sold 1927 to (Kraushaar Galleries, New York); sold 1927 to Chester Dale [1883-1962], New York; bequest 1963 to NGA. Modern French Paintings, Watercolors and Drawings, C.W. Kraushaar Art Galleries, New York, 1927, no. 1, repro. Loan Exhibition of Modern French Art from the Chester Dale Collection for the Benefit of the French Hospital of New York, Wildenstein Galleries, New York, 1928, no. 1. Loan Exhibition Held by New York University Gallery of Living Art: Contemporary Paintings, Brummer Gallery, New York, 1929, no. 40. Exhibition Commemorating the Twenty-fifth Anniversary of the Opening of the Albright Art Gallery, The Buffalo Fine Arts Academy, 1930, no. 3, repro. "La Nature Morte" from Chardin to the Abstract, Wildenstein Galleries, New York, 1930, no. 18. A Group of Twentieth Century Paintings from the Chester Dale Collection, Department of Fine Arts, Carnegie Institute, Pittsburgh, 1931, no. 1. Exhibition of French Painting, Pennsylvania Museum of Art, Philadelphia, 1937, no catalogue. The Development of Flower Painting From the Seventeenth Century to the Present, City Art Museum, Saint Louis, 1937, no. 28, repro. Contemporary Movements in European Painting, Toledo (Ohio) Museum of Art, 1938, no. 9, repro. Seven Centuries of Painting, California Palace of the Legion of Honor and The M.H. de Young Memorial Museum, San Francisco, 1939-1940, no. 171. Twentieth Century French Paintings from the Chester Dale Collection, Art Institute of Chicago, 1943-1952 (extended loan), unnumbered catalogue, repro. 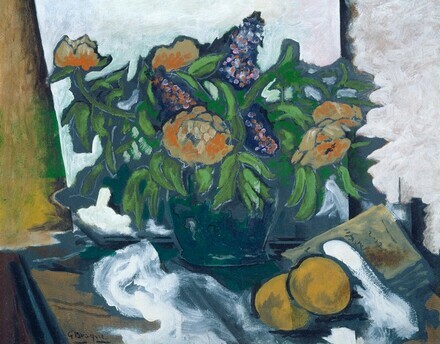 Twentieth Century French Paintings from the Chester Dale Collection, National Gallery of Art, Washington, D.C., 1952, no. 14, repro. Aspects of Twentieth-Century Art, National Gallery of Art, Washington, D.C., 1978-1979, no. 33, repro. Dale, Maud. Before Manet to Modigliani from the Chester Dale Collection. New York, 1929: no. 78, repro. "Still Life 'From Chardin to the Abstract' Revealed in Show." Art Digest 4 (15 January 1930):11, repro. Twentieth Century French Paintings from the Chester Dale Collection. The Art Institute of Chicago, 1943:, 13, repro. Twentieth Century French Paintings from the Chester Dale Collection. National Gallery of Art. Washington, 1952 (2nd ed., 1960; rev. ed., 1965): 14, repro. Twentieth Century French Paintings from the Chester Dale Collection. National Gallery of Art, Washington, D.C., 1960 (2nd ed. ): 15, repro. Summary Catalogue of European Paintings and Sculpture. National Gallery of Art, Washington, 1965: 20. Twentieth Century French Paintings & Sculpture of the French School in the Chester Dale Collection. National Gallery of Art, Washington, 1965 (rev. ed. ): 14, repro. European Paintings and Sculpture, Illustrations. National Gallery of Art, Washington, 1968: 12, repro. European Paintings: An Illustrated Summary Catalogue. National Gallery of Art, Washington, 1975: 46, repro. Walker, John. National Gallery of Art, Washington. Rev. ed. New York, 1984: 598, no. 927, color repro. European Paintings: An Illustrated Catalogue. National Gallery of Art, Washington, 1985: 67, repro.